Exclusive to Babipur special edition Dewi print daffodil play mat. Bring your Pop-in Play Mat to the park, the beach, the city, in the garden and house too. Roll 'em up and away you go. Pop-In water resistant play mats have multiple uses and will be enjoyed by your family for years to come. 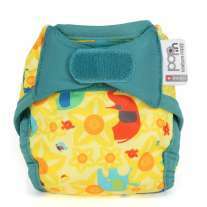 For little babies, they're great for tummy time, going nappy-free and for baby massage. Older babies and children will enjoy sitting and playing on them outdoors, and all of the family will make use of them for trips to the beach and picnics too. 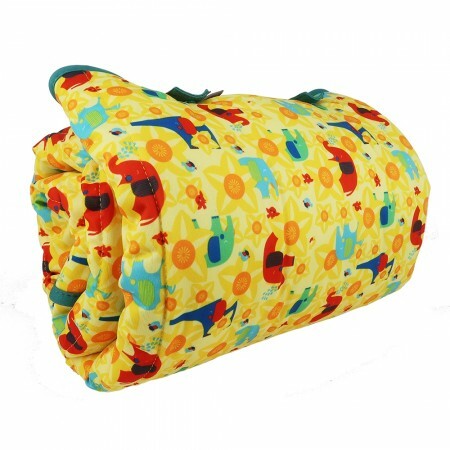 These large mats have a water resistant and stain-resistant print side and a colourful, wicking fleece layer on the reverse. 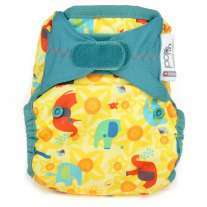 They roll up neat and have a detachable handle for carrying and fastening it into a roll, which makes it ideal for taking with you to baby groups and days out - just remember to remove the handle before putting your baby down on it. 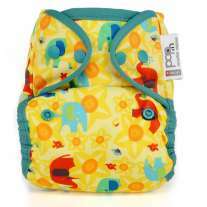 We love the bright patterns which match up with a whole load of other baby and toddler essentials from Close Parent. 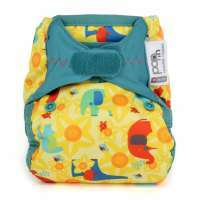 The range includes nappies, bibs, burp cloths, play mats, swim nappies, rash vests, car seat protectors and training pants. Team up this bib with some other items from the range for a fab baby present. Made from 100% polyester laminate with a PU membrane and 100% polyester wadding.